SOLDOTNA — Fishermen already know the Kenai River offers a bounty of fish. But for hikers like me, it's also the backdrop to one of Alaska's most interesting short forest hikes: The Upper and Lower Kenai River trails, both of which were partially rerouted two summers ago. There are two trailheads off Skilak Lake Road: The Upper Kenai River Trail starts from the east trailhead, 0.7 miles in from Skilak Lake Road's eastern juncture with the Sterling Highway. The second trailhead, for the Lower Kenai River Trail, starts another mile along the same road (at mile marker 1.7). 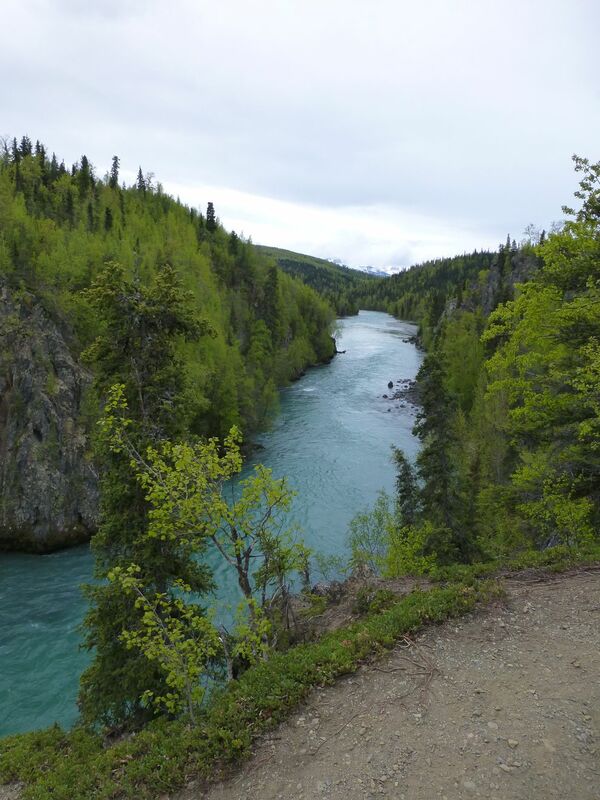 Starting from the east/upper trailhead, it's a short jaunt to the lip of Kenai River Canyon, where you get almost a mile of periodic overlooks of the milky, aquamarine water. Those views are reason enough to come here, and along the way to the canyon's rim you'll pass a couple of short, easy side trails down to the river edge. Next, the Upper Kenai River Trail works its way down from the rocky canyon lip via a rough stone staircase, then winds along the hillside contours like a line on a topo map, leading you through a mature forest of alder, spruce and willow on a narrow but clear trail. The forest is so mature that a few trees have fallen across the trail — so be ready to climb over or duck under. This section was reworked three years ago by Kenai Wildlife Refuge trail crews to route the trail away from swampy areas; now it's an easy walk on dry ground. This is also a great place to practice your plant identification skills on wild roses, lupine, blueberries, low-bush cranberries and more. Even though the trail leads you somewhat away from the river, you can still see it periodically, a rich aquamarine jewel that makes commanding appearances through the trees. The Lower Kenai River Trail, on the other hand, makes an easy descent through forest to meet the Upper Kenai River Trail. From the juncture it's 1.8 miles back to the upper/east trailhead and 1 mile to the lower/west trailhead. Part of the Lower Kenai River trail was rerouted two years ago, with labor from high school students on a Student Conservation Association crew. Your choices at this point are to link the two trails in a tiny thru-hike, go back to the Upper trailhead for more great views, or follow the Lower Kenai River trail as it winds down a forested ridge. This is a particularly good trail for playing plant detective because you pass through both mature forest and the relics of two forest fires. The first was the human-caused Pothole Fire in 1991, which burned 8,700 acres; the second was a much smaller fire in July of 2004, which burned 46 acres. As you approach the aforementioned intersection you'll see the forest's character change from mature trees to fresh-faced aspens with slim gray trunks and bright green leaves. Together with the wild roses and occasional baby spruce trees, these young trees muster almost enough greenery to cloak the blackened stumps and logs left over from the fires. All those aspens are, technically, just one tree that's cloned itself, over and over, from the roots — in fact, the largest known living organism on the Earth is an aspen tree in Utah that's cloned itself to cover more than 100 acres. Aspen are one of the early species that establishes itself after a forest fire. The lower trail takes you down a short, steep, but easy-to-negotiate ridge in this young, recovering forest, losing about 500 feet of elevation in less than half a mile and taking you down to the water's edge. From here, the trail dissipates into grassy fishing paths that aren't much fun for hikers, but there's a pretty little black sand beach before the trail gets too bad. This is a great spot to sit back and enjoy the water before you head back up. On your way back to the upper trailhead, you get a second shot at those beautiful views over the canyon, along with some great views of the mountains once you top out at the first overlook and head back to your car. If you take this route, it's about a 5.5-mile round trip from the upper/east trailhead down to the river, then back again, with only about 500 feet of total elevation gain. Be sure to be especially "bear aware" on this trail: Travel in groups, carry bear spray, make plenty of noise, give critters plenty of space, and know what to do if you happen to meet a bear — or moose — in close quarters on the trail. Road, but you get better river views if you hike out and back from the first trailhead. This road sometimes has terrible ruts, so proceed with caution.